On December 5th, guests joined Just One Eye to celebrate the launch of Ulysses Tier 1: The Ultimate Disaster Relief Kit in Los Angeles. The event was produced by Bureau Betak, with a special live performance featuring helicopters and veteran Navy SEALS, as well as choreography by Blanca Li and flowers by Eric Buterbaugh. 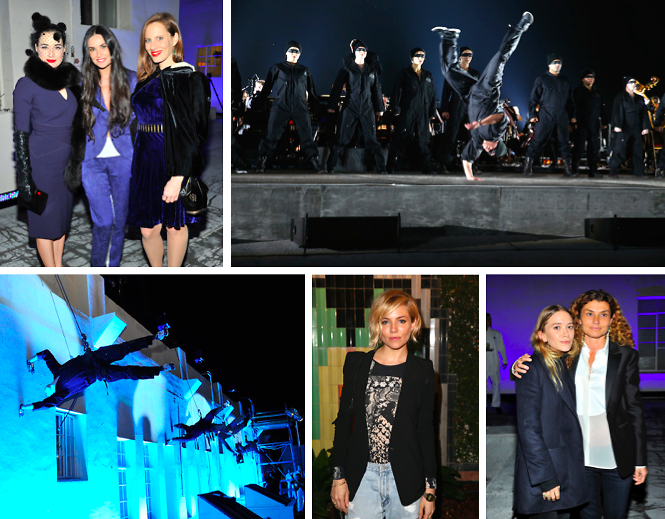 Notable attendees included Demi Moore, Mary-Kate Olsen, Sienna Miller, and Dita von Teese, among others. The kit, developed by 4Cs Consulting as well as the help of veteran US Navy SEALS, includes nine main sections uniting new and old technologies to create a survival kit for disaster situations and emergencies. Companies associated with the kit include Summit, with the kit's night vision goggles, and Half Face Consulting, with the custom knife for the project. For an inside look a the event, consisting amazing performance shots and plenty of celebrities, click through our slideshow. Who was there: Guests included Just One Eye’s Paola Russo, Mary-Kate Olsen, Demi Moore, Sienna Miller, Dita Von Teese, Nate Lowman, Amber Rose, Rose Apodaca, Alexandre Vauthier, Arianne Phillips, David LaChapelle, George Kotsiopoulos, Ahna O’Reilly, Liz Goldwyn, Angelique Soave, Ally Hilfiger, Rebecca Dayan, Sofia Sanchez Barrenechea, Victoria Niarchos, Stavros Niarchos, Theo Niarchos, Magda Berliner, Cher Coulter, Keegan Singh, Maryam Malakpour, Joachim Ronning & Ambre Dahan, Angelique Soave, Chip Sullivan, Aura Dione, Karla Otto, Blanca Li, Cathy Lobé Guetta, and Blake Lee.